Recommended by reader Reginald (thanks!). The absense of type makes this even more elegant. I have No. Idea. Who. That. Is. The kid in Borders is going to know where to shelve this? When I search for this on Amazon, I'm going to search under "Smoking Poet"? Touche, Dwight. 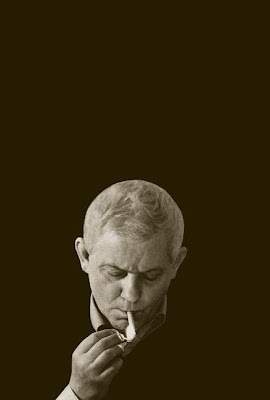 It's Zbigniew Herbert. I'm assuming that the poet's name is on the spine. I'm not a scholar of poetry, but I've read a little. I know some stuff. And I have No. Idea. Who. That. Is. Young(er) Frost? No. Don't think so. Not Sandburg either. What kind of ego does one need to try and pull this off? The kid in Borders is going to know where to shelve this? When I search for this on Amazon, I'm going to search under "Smoking Poet"? I was in on the meetings where this jacket was chosen. His name is on the spine, which is all you'll see at the bookstore. All the other info that is ordinarily on the front of the jacket is on the back. The fact is, the collected poems of Herbert aren't going to sell a ton of copies no matter what image you use on the front of the jacket. This is for people who already know Herbert. If you don't already know who he is, you weren't going to buy it anyway. It's a stunning design, and a fantastic picture of Herbert. It is a fantastic cover. I really enjoy the designs that are going outside the box lately. The shelves are so stacked anymore that you really need a fantastic cover to stand out. I love Herbert, and this cover is my favourite of the year by an absolute mile.